Drip irrigation systems have many benefits over other types of irrigation. Micro irrigation systems can deliver water and nutrients to the root zone in precise amounts and at controlled frequencies, can help control pests and diseases with less humid, and can control weed population. But, sometimes there is the most serious problem namely clogging of emitters. Emitter plugging can severely hamper water application uniformity. Sub surface irrigation presents some additional advantages -drip emitters are protected, and runoff and evaporation are minimized, increasing irrigation efficiency even more. So that, micro-irrigation systems should be properly planned and managed, in order to gain these advantages. One of the main challenges is how to prevent clogging of emitters in drip irrigation. Actually, there are several causing why clogging of emitters can occurs, i.e biological, physical and chemical factors. It is useful to differentiate between surface water and ground water because different water sources carry different plugging hazards. The most common physical causes of clogging of emitters in drip irrigation systems are sand and silt-sized particles which found in surface water. Other suspended solids may be too large to pass through the emitter's opening and might clog it. Under certain conditions, silt-sized particles can form larger aggregates, that may cause clogging. Turbidity is often used as an estimate of the suspended solids, but is not an accurate indicator of the water's clogging potential. An adequate filtration system, designed based on the quality of the water, can prevent physical plugging of drip systems. 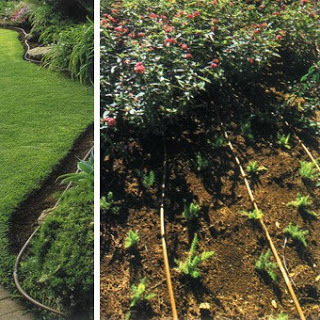 Drip irrigation systems provide a benefit environment for bacteria, fungi and algae that can make slime accumulation. Bacterial slime can be a direct cause for clogging of drippers, but it can also induce mineral particles to stick together and form aggregates large enough to clog the emitter openings. This phenomenon is specifically significant when manganese, sulfide and iron are present in the water. Depending on the type of bacteria responsible for the slime, its color may be yellowish, reddish or grayish. Clogging commonly occurs due to microorganisms when using water with relatively high iron or manganese levels, high biological activity, and hydrogen sulfide compounds. Proper chlorination and disinfection procedures are the key to control biological clogging of drip irrigation systems. "Chemical" denotes mineral precipitation, which may form when minerals solubility is low enough. Solubility of a given mineral is dependent on the its pH, water temperature, redox potential and the concentration of the mineral elements present in the water. The common elements that may clog drip emitters by precipitation and sedimentation are magnesium, manganese, iron and calcium, where calcium carbonate being the most common precipitate. Water that contain high levels of these elements, and have a pH above 7.0, might potentially cause clogging of drip emitters. In addition to adding fertilizers to source water (fertigation) can potentially cause clogging of emitters in micro irrigation systems due to high mineral concentrations and chemical interactions, exceeding their solubility limit. Therefore, it is advised to perform a jar test, or use an appropriate software, to determine if a specific combination of fertilizers may result in precipitation. Acid injection, to reduce irrigation water pH, can prevent chemical clogging of drip emitters. Generally speaking, surface water carry more biological and physical clogging agents, while ground water are usually caused by chemical clogging hazard that characterized by higher mineral concentration. Test your source water and irrigation water for the 3 types of clogging causes. Filter large particles or aggregates, such as sand and clay, before letting the water enter the emitters. Eliminate microorganisms by proper disinfection and water treatment. Prevent sedimentation of chemicals in the irrigation system by adjusting pH levels, monitoring solubility limits of fertilizers and avoiding chemical interactions between fertilizers. Maintain the irrigation lines and emitters by periodical flushing. 0 Response to "How to Prevent Clogging of Emitters in Drip Irrigation Systems"